Network & Communications - A PC-based network management application designed for small and medium-sized business (SMB) networks with up to 250 users. Quality of Service (QoS) - Automatic QoS (AutoQoS) simplifies QoS configuration in voice over IP (VoIP) networks by issuing interface and global switch commands to detect Cisco IP phones, classify traffic, and help enable egress queue configuration. VLAN - Multicast VLAN Registration (MVR) continuously sends multicast streams in a multicast VLAN while isolating the streams from subscriber VLANs for bandwidth and security reasons. The new Catalyst 2960-C Series Compact Switches simplify IT deployments cost-effectively. Powerful security capabilities provide comprehensive protection. And you get a Cisco enhanced limited lifetime warranty. 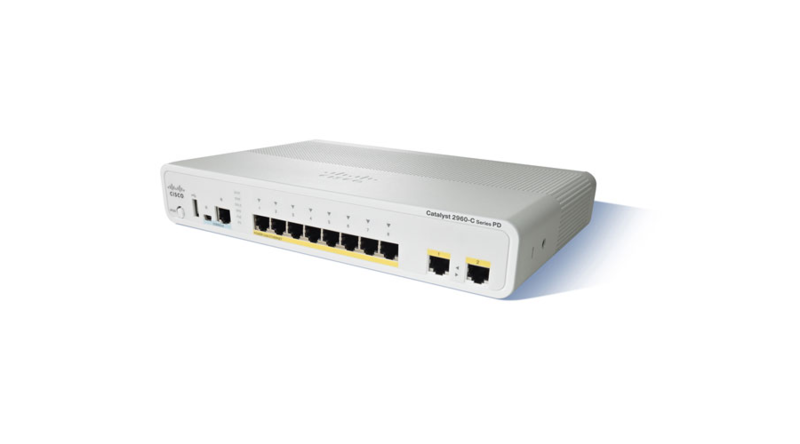 Cisco® Catalyst® compact switches easily extend an intelligent, fully managed Cisco Catalyst wired switching infrastructure, including end-to-end IP and Borderless Network services, with a single Ethernet cable or fiber from the wiring closet. These attractive, small form-factor Gigabit and Fast Ethernet switches are ideal for connecting multiple devices on the retail sales floor and in classrooms, hotels, and factories and for extending wireless LAN networks: wherever space is at a premium and multiple cable runs could be challenging. Dual-purpose uplinks for Gigabit Ethernet uplink flexibility, allowing use of either a copper or a fiber uplink; each dual-purpose uplink port has one 10/100/1000 Ethernet port and one Small Form-Factor Pluggable (SFP)-based Gigabit Ethernet port, with one port active at a time.